(Nanowerk Spotlight) The significant research interest in the engineering of photovoltaic (PV) structures at the nanoscale is directed toward enabling reductions in PV module fabrication and installation costs as well as improving cell power conversion efficiency. With the emergence of a multitude of nanostructured photovoltaic device architectures, the question has arisen of where both the practical and the fundamental limits of performance reside in these new systems. A particular advantage of nanotechnology materials is the tunability of their optical and electronic properties, which enables improved PV power conversion efficiencies by implementing strategies for reducing thermal losses. A recent review article in Advanced Materials ("Practical Roadmap and Limits to Nanostructured Photovoltaics") addresses the limits to the performance of molecular, organic, polymeric, dye-sensitized, and colloidal quantum dot-based solar cells. For the purpose of the review, nanostructured photovoltaic devices are defined as solar cells that 1) consist of thin films (< 2 µm) of semiconductor material, 2) incorporate nanoscale optoelectronic materials that 3) have excitonic or quantum-confinement character and 4) can be fabricated entirely with low-temperature (< 300°C) processing steps. Especially the last point, the compatibility of many nanostructured PV materials with the use of low- temperature processing can enable the use of flexible, lightweight substrates, potentially leading to a lower cost of solar module fabrication and installation. Written by scientists from MIT and Michigan State University, led by professors Vladimir Bulovic and Richard R. Lunt, the review discusses the specific challenges associated with improving the electrical power conversion efficiency of various nanostructured photovoltaic technologies and reviews several approaches to reduce their thermal losses beyond the single bandgap limit. After considering the theoretical limits of PV operation, and comparing the operating parameters for a broad range of reported nano-PV structures with these theoretical limits, the team reviews the challenges associated with each type of nano-PV device – small-molecule and polymer PVs, dye-sensitized solar cells (DSSC), and colloidal quantum dot PVs – and suggest particular areas for improvement in order to approach the theoretical efficiency limits. A number of architectures have been proposed for reducing losses in solar cells in order to overcome the Shockley and Queisser single-junction limit. These include hot carrier solar cells, intermediate band solar cells, up- and down-converters, and concentrators, as well as cells that utilize multiple-exciton generation, exciton fission, and tandem stacking. While all of these approaches hold promise, the review focuses on the latter three, in which nanostructured materials are particularly relevant. The authors also address critical considerations related to the module lifetime and cost that are unique to nanostructured photovoltaic architectures. 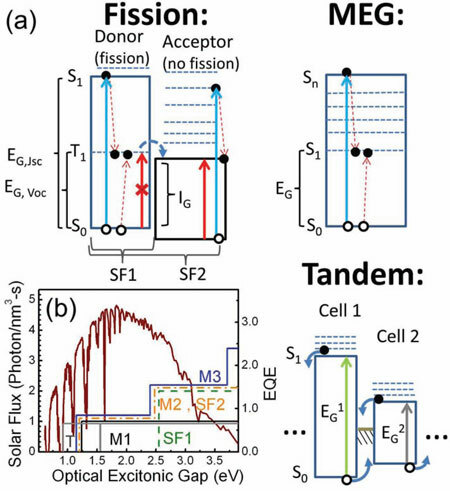 The analysis suggests that a practical single-junction laboratory power conversion efficiency limit of 17% and a two-cell tandem power conversion efficiency limit of 24% are possible for nanostructured photovoltaics, which, when combined with operating lifetimes of 10 to 15 years, could position them as a transformational technology for solar energy markets. Beyond commercial viability, solar cell lifetime is acute in the lifecycle analysis and their carbon footprint: "To have any impact on reducing carbon emission, solar cells require lifetimes longer than the energy payback time; since the present PV cells will be produced by using electricity that is primarily generated through burning of the fossil fuels, the CO2 emission factor of PVs is then inversely proportional to the cell lifetime and efficiency." Calculations show that a reduction in the lifetime to 5 years would significantly diminish the carbon footprint advantage of nano-PVs, particularly if the power conversion efficiency remains below 10%. While the cell lifetime has only a small impact on overall cost beyond 10 years, extending lifetimes well beyond this range will have a significant role in the ability to produce and promote "clean" renewable energy.